I’ve made a light version of exGENT with only a few necessary packages pre-installed. 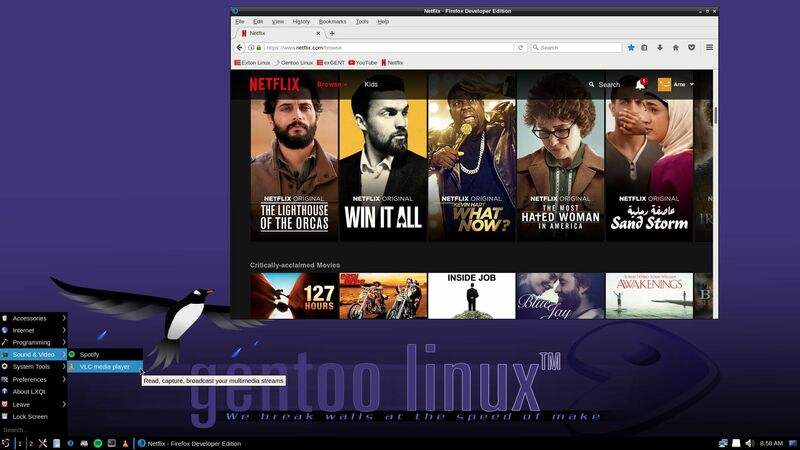 It uses LXQt 0.11.0 as Desktop environment and kernel 4.10.4-aufs-gentoo-exton-s. The ISO file is of only 1090 MB compared to exGENT version 170407, which is of 2620 MB. Study all packages installed in Build 170412. I’ve made yet a new version (20141205) of exGENT. This time for the 32 bit architecture. I call it exGENT 2015 LXDE Live DVD. The new version (141205 of 1170 MB) uses LXDE as Desktop environment. All installed packages in exGENT 32 bit have been updated to the latest available version by 141205. I have included Porthole Package Manager also in this version of exGENT. Used kernel: 3.16.5-gentoo-exton. I've made yet a new version (20140210) of exGENT 2014. This time for the 32 bit architecture. The new version (140210 of 1080 MB) uses LXDE as Desktop environment (as my previous 64 bit version from 140207). All installed packages in exGENT have been updated to the latest available version by 140210.